The Dust Bowl or “The Dirty Thirties” was a severe drought that affected over 100,000,000 acres in the corners of Texas and Oklahoma and touched adjacent sections of New Mexico, Colorado, and Kansas. Maybe you remember reading John Steinbeck’s “Grapes of Wrath” or “Of Mice and Men?” The phenomenon forced tens of thousands of families to abandon their farms and homes. Many of these families, who were often known as “Okies” because so many of them came from Oklahoma, migrated to the golden hills of California only to figure out that the Great Depression had left economic conditions there little better than those they had left. More than 500,000 were left homeless due to the drought and conditions created by it. The US population in 1935 was 127.3 million, California today is over 38.8 million. The Dust Bowl affected area of 100,000,000 acres is close in proximity to the size of California which has a total land and water area of 104,765,440 acres. So what is California and the West going to do? Is history going to repeat itself? Migrant Mother, Florence Owens Thompson escaped the drought by heading to California. She was 32 and mother of seven. Are Californians on their way back to Oklahoma? 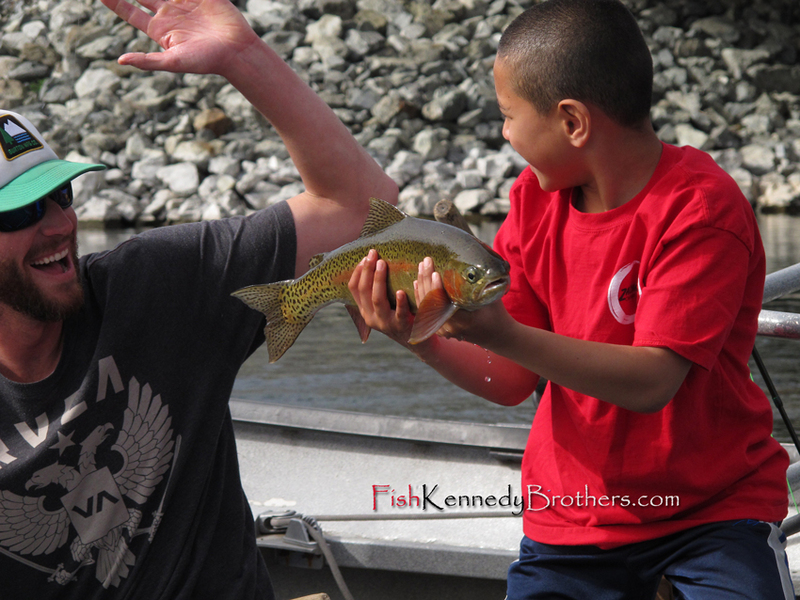 Take Kids Fishing, Take them Fly Fishing! Do you remember that moment when you realized you were going to have to make your own decisions in life? You’re nine years old, and you’re new to the whole fly fishing thing. You’re not exactly a rookie in your eyes but you catch more fish than your dad. You’re at a point where you know your guide is going to teach you how to handle your own fish, that slimy creature that peers into your soul just before you release it back into the shadowy depths. You finally break through the fear and muster up enough courage. Just be cool and go with the flow. Then it happens. You did it! Pure excitement, the whole family and the Kennedy Brothers are cheering. You make one last look at the camera for dad’s photo as he calls over for you and suddenly to your surprise you notice your guide. Your mentor and buddy who is also twice as big as you, he fishes with ex-KGB agents, the one who ducks through doors and has hands bigger than your head. You’re cradling your fish delicately with both of your dripping wet hands and… he’s going for the high five! What would you do? Do you remember that moment? I do. The weather after the rain has been delightful and it has forced an early emergence of caddis. Not quite the blanket hatch yet but it’s been close some days. March brown’s, baetis, pmd’s, stone’s and midges are also abundant with some dry fly fishing showing up. It’s a great time on the Lower Sacramento and it’s only going to get better. With the way the water situation is shaping up it’s looking like we may have one of the best spring seasons in history. The media may highlight the drought and it’s severe consequences but there are some upsides. The Lower Sac is one of them. Steelhead fishing on the Trinity River is the other. We are currently focused on our spring bookings and although were are not full, the holes are starting to fill in. Get your dates before it’s too late. The lack of rain in California has left some of the West coasts largest reservoirs under 50% capacity, and as a result, the Lower Sacramento River is the lowest we have ever seen: a whopping 3000 cfs (cubic feet per second). At these levels there are features showing that are normally hidden below feet of water. It’s almost like fishing a different river, and a sense of adventure accompanies the newness of it all. The weather has obviously been unusually dry and warm, yet the crowds are thin. I guess everybody thinks that there aren’t many good fishing opportunities out there without rain? Guess again. The fish still have to eat and the weather is about as good as gets. Come see for yourself. WOW! A beautiful Northern California rainbow trout! We fished in Redding yesterday from the Posse Grounds, under the Sundial Bridge, down to Bonnyview. It seemed as though the recent drop in flows had the fish a little off, but with the help of some midday, mayfly hatches, we were rewarded for our efforts. As the morning temperatures began to rise, we encountered a small baetis hatch, nothing major, but it was just enough to get the fish active. The best flies during these moments were size 18 Hogan’s S&Ms in an olive color, Mercer’s Trigger Nymphs, olive Pheasant tails, and Mercer’s Poxyback BWOs, fished in the deep runs, from the end of the riffles all the way down to the tail-outs. Another day on the Lower Sac and not a soul around. Wanna fish? In the heat of the day, the action slowed, but we began to see birds flying out over the river to flutter for a moment, then return back to the branch from which they flew. They were clearly feeding on some aquatic insect emerging from the water. A quick back row and a dropped anchor in the chop. All eyes on the surface. Small pale orange mayflies were bobbing through the waves headed downstream to dry their wings and fly away. We quickly changed our setups from olive to brown and yellow mayfly patterns and we were back in the water. Our first drift through the run informed us we were on the right track. Double! The best patterns during this hatch were brown S&Ms, yellow Flatulators, Poxyback PMD’s, and yellow Mercer’s Glint Nymphs, all in a size 16. The lesson here is to always be aware of your surroundings. As conditions change, so do the bugs and ultimately what the fish are eating. In an environment as large as the Lower Sacramento River these hatches can change run to run so stay on top of it. Sometimes it takes slowing down and observing rather than continuing to flog the water. 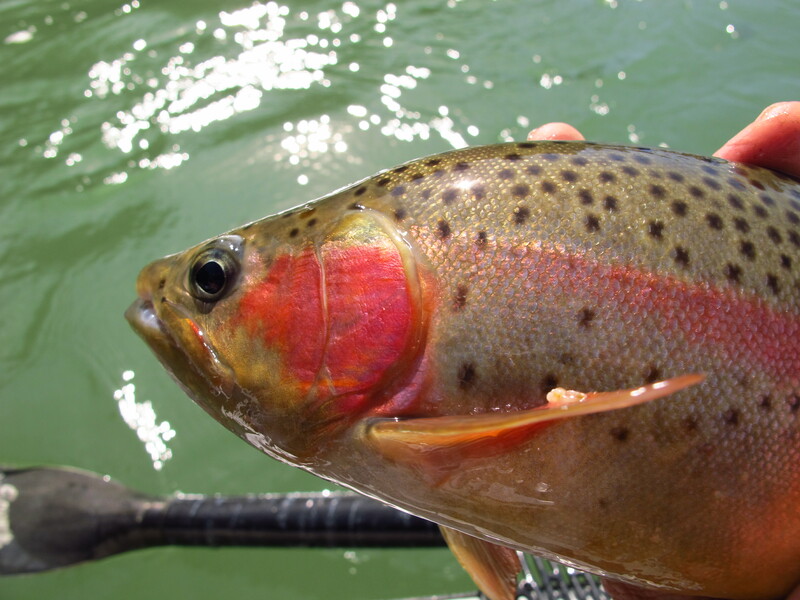 Another wild rainbow trout from the river in Redding, California. It’s been absolutely beautiful this week! We’ve had productive conditions throughout December and the trend is continuing into the New Year. This next week we are expecting air temperatures at least 10 degrees above normal so some more t-shirt weather is in order. The river is currently running at 3,570 CFS and should remain near current levels with some minor adjustments through the next several days. The dreaded bead has not been the big producer although there are days and locations where egg patterns significantly improve your chances. Other places it acts as a super repellant. The midday baetis hatch as been the bug de jour and highlight without question from the top floats down to Los Molinos. Decent spring caddis hatches are already showing on the upper floats although timing has been variable. 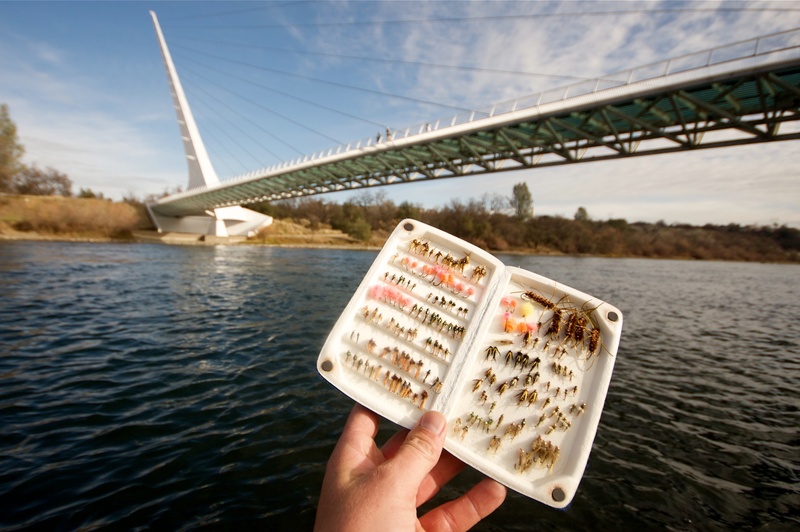 Fish throughout the Sacramento River are keying on small mayflies and are a must have on every setup all day long. Looking for some dry fly fishing? We have opportunities daily on both the Lower Sac and the Trinity River. Do you need a post holiday decompression? Now is the time!